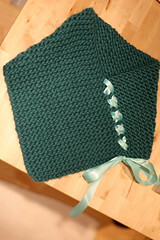 Photo of one of Anne Petersen's finished items, by Anne Petersen. Jen’s knitting workshop has been a great success with almost 10 attendees and many people who had never knitted before already finishing multiple projects. Therefore, Jen is teaming up with Gretchen to run the knitting workshop every Monday. If you want to learn how to knit and haven’t attended yet, you now have double the opportunities to learn. Come by any Monday at 7pm and start making something! I am interested in the post on Craigslist I have been trying to learn how to knit by myself but find it hard to self teach I am basically a hands on person. You say you have free yarn I have old yarn which I can practice with I just need some one to coachme(teach) i guess I keep getting my tension to tight.Is this the correct address of the Pumping Station on Elston ave?, also would I be able to attend Monday?